Pets are highly intuitive when it comes to sensing pain or illness, and have sharp instincts regarding the many ways they can be of assistance. Service dogs have been engaged in this endeavor for hundreds (possibly even thousands) of years, with the first recorded service dog training dating back to 1750’s Paris. The Seeing Eye dog training school was established stateside in 1918. Since the 1990’s, service dogs and assistance dogs have become universally welcomed and accepted. Service dogs continue to assist blind people and those with hearing impairments, as well. However, it has fortunately become common for highly trained dogs to help individuals with diabetes, veterans suffering from PTSD, people with other emotional and psychological disorders, children on the Autism spectrum, and more. Mobility – Dogs can be highly influential for kids that need help moving around, bringing increased independence to those with mobility-related disabilities. 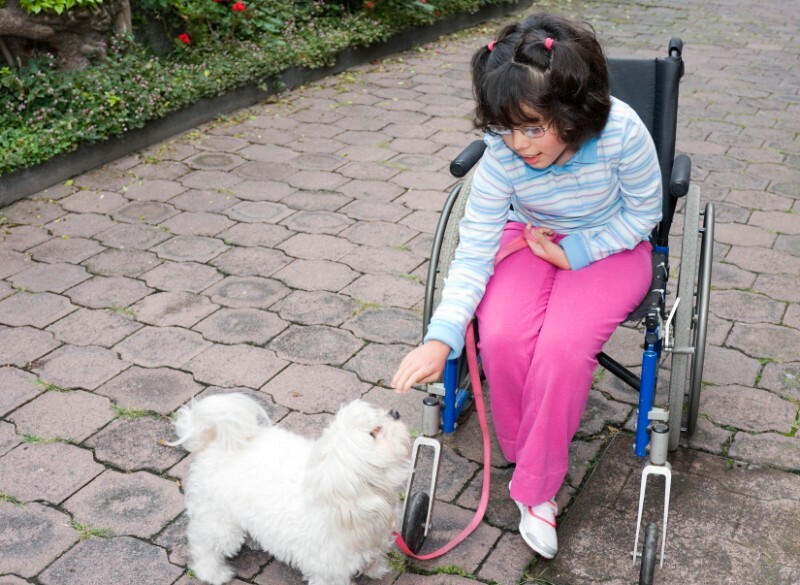 Keen Sense – Pets help kids with disabilities with their keen senses. They can detect oncoming seizures, dangerous dips in blood sugar, remove obstacles, and alert adult caregivers. They can even remind their young owner to take medication. Security – Service pets give an astounding level of protection to their young charges. Not only essential for kids that wander off or sleepwalk, these animals offer calm feelings of protection and security. Known for decreasing social anxiety and stress, pets help kids with disabilities relax. Many pets do not have special training, but these pets help kids with disabilities anyway. Just by being near by, these pets purr, encourage play, and have soft fur to stroke. In other words, by simply being themselves, these pets (including rats, horses, rabbits, and even goats) help kids coping with different disabilities live normal lives. Everyone can benefit from living with animals, and the affectionate bond between kids and pets is unique. If you have further questions about the many ways pets help kids with disabilities, the Pet Experts encourage you to reach out to us. We’re always here for you at Wheaton Animal Hospital. Next: Pet Dental Care: Is it Really Worth it?